It's important to seal wood before painting it to ensure an even coating -- but when you're going to finish the wood with a clear coating like lacquer, you want something extra from the sealer. It should be easy to sand, and should provide a smooth undercoat that bonds well with the finish. Sanding sealer helps to ensure a quality topcoat, but should be used conservatively -- one or two coats at most -- as too much of this soft undercoat can cause a more brittle one, like lacquer, to crack and peel. Sanding sealer contains soap to make it easier to sand. The professional finishers most likely to use sanding sealer are those spraying clear lacquer on furniture -- especially tabletops -- and who are looking for the smoothest possible finish. Sanding sealer is basically lacquer, but it contains zinc stearate, which is a soapy substance that makes the sealer easier to sand. 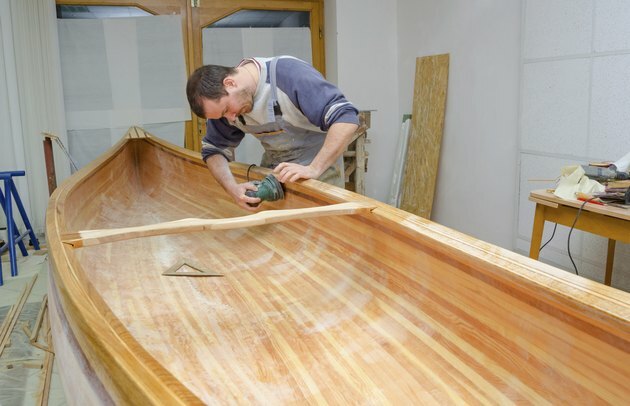 The first coat of finish inevitably raises the wood grain, and when you use sanding sealer for that coat, the job of sanding the grain back down is more easily accomplished. You spray or brush sanding sealer -- depending on the volatility of the product you use -- on freshly sanded wood. It typically dries in 30 minutes to an hour, and you then sand it by hand, using 150- or 220-grit sandpaper. The bulk of the product should be sanded off. When you're done sanding, you prepare for the next finish coat by wiping off the fine soapy residue with a rag.